In a loaded final at Texas Motor Speedway, it was anything but ordinary in this race. In the final, the racers were able to take the joker lap the first lap and many did, led by Isachsen who spun with Marcus on his tail, which slowed the Charlotte champ, but didn’t deter him as he lead a group that included Ken Block around the track. The second pack was led by Brian Deegan who hit the jump first. It was all a moot point as two laps in, Isachsen had to hit his brakes to not hit David Binks and stalled on the ramp. This brought out a full course red flag and all the remaining racers were brought back to the start line. 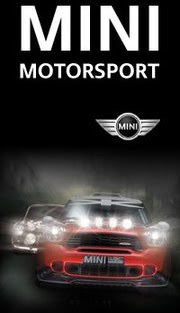 The racers were lined up on the start line in original positions to give it another go. It was a mirror copy of the first race, with Gronholm and Block taking the joker lap. Deegan, again, lead the second pack, but all was not to stay simple. Ken Block went off the track, into the grass with a flat front wheel. In the Deegan pack, Andy Scott and his team mate Sam Hubinette were beating and banging on each other near the flat jump forcing Andy not to take it. But all was still not well with Scott as his car failed after the gap jump and his car smashed into the tires, which caused yet another red flag situation as the tires went into the oncoming lane of racing. The racers were then lined up for yet ANOTHER shot at a full race before the track needed to be cleared of jumps and water for the Indy Car race. Just like the other two starts, Marcus Gronholm took the joker lap right off the line. He was followed by Hubinette, Millen and Block. Unlike the last two starts, it was Foust who lead the 2nd pack. Block, Scott and Isachsen were never competitors and were off quite quickly into the race. While both Brian Deegan and Tanner Foust gave it all they had through the joker laps , they were not match for the flying Finn, Marcus Gronholm, who is the man to beat heading into the XGames. With his Charlotte win and the win at HoonKaboom Texas, Marcus Gronholm is now the points leader. 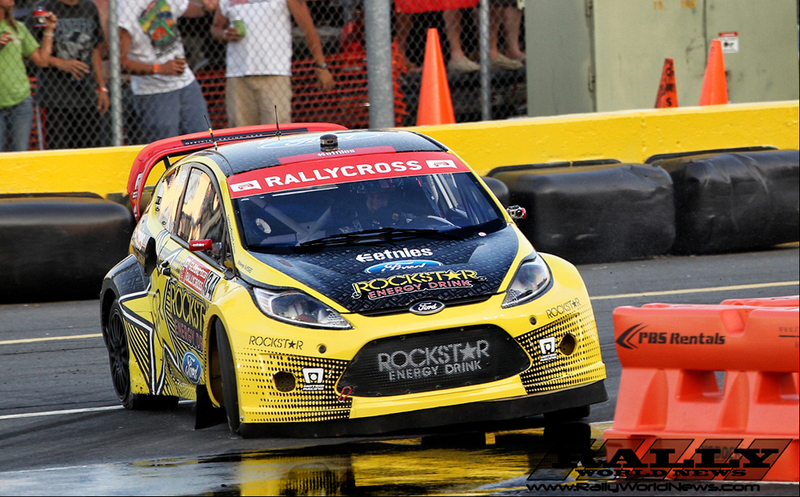 The Global Rallycross points are now: Gronholm (42), Foust (36) and Verdier (26), Millen (24) and Hubinette (23). 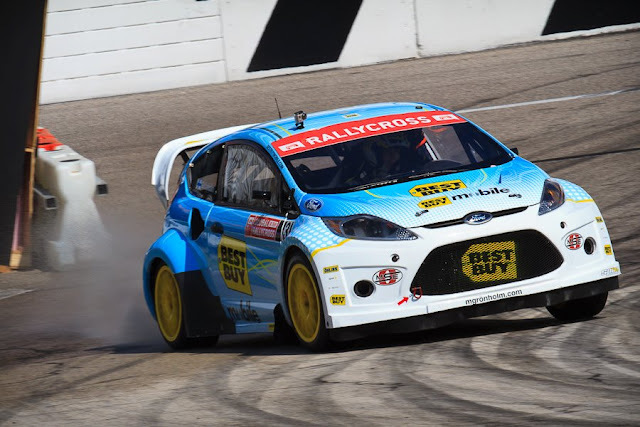 Global RallyCross Texas Reports by Donna Tocci.